Disclosure: One of us owns this. Have you ever been on an airplane in extreme turbulence? The plane is dipping like a rollercoaster. Up, down. More down. Your neighbor beside you is holding onto their seat for dear life, white knuckles and all. Well, much like panicky airline passengers… some investors in Westjet are likely holding onto their desk right now (or maybe a glass of sangria) with white knuckles too. 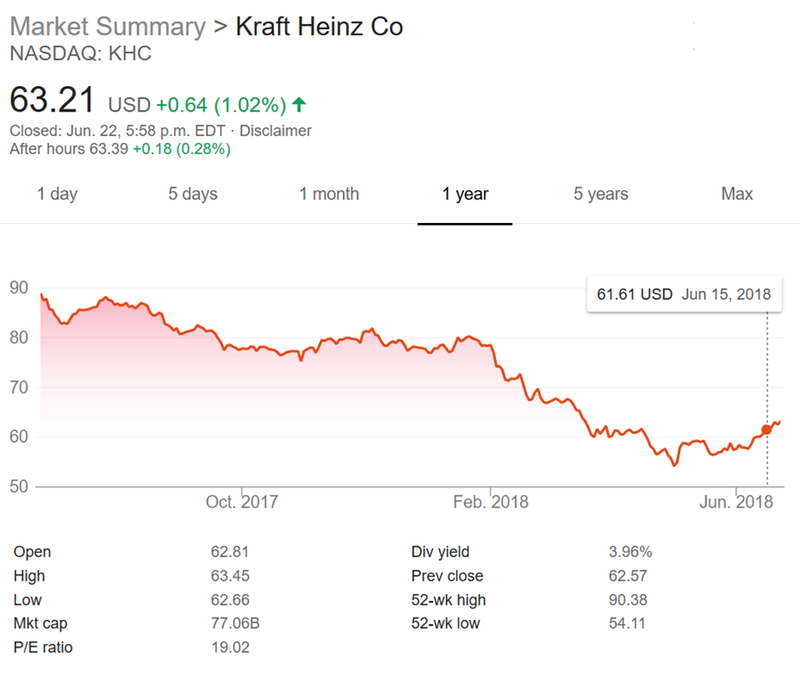 Over the last 6 months the stock has hit quite the nasty air pocket, dropping about 35% to ~$18. We are now not far off of the $15 bottom in 2016, which happened due to the (now over-hyped in hindsight) concerns over their exposure to Western Canada’s oil driven nature. -Fuel prices – Not a problem exclusive to Westjet but oil keeps on rising and as we write this article, prompt WTI is trading at ~$75. As a buyer of 1.5 billion litres of jet fuel a year, some think this is a major problem for Westjet. Let’s evaluate these issues one by one. But First - How have they done over the last 15 years? 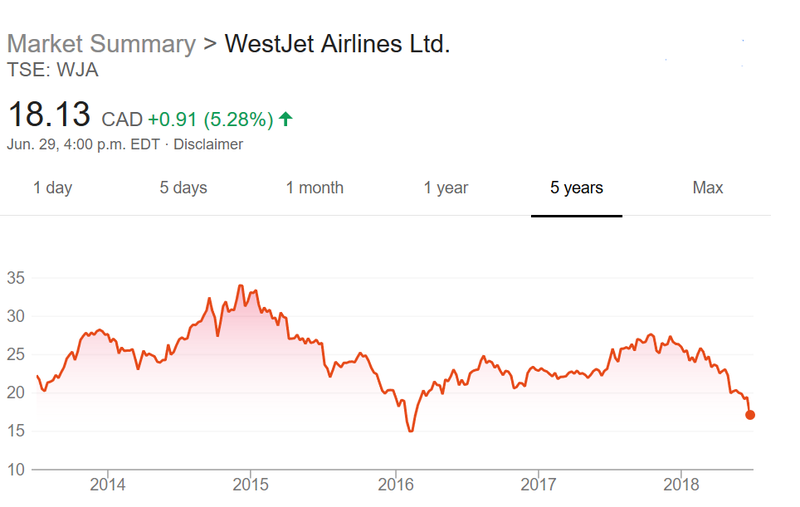 To evaluate how Westjet has performed, we break it into two key items: Do they demonstrate 1) cost/margin control while growing, and 2) profitable growth. Note: Before reading this article, we strongly recommend you read our article on the big four U.S. airlines and Berkshire Hathaway's 2016 purchase of about 10% of each, which can be found here. A key to airline profitability is ensuring your RASM is bigger than your CASM. RASM is revenue per available seat mile, which is basically total revenue divided by the total number of miles their planes fly. CASM is the cost of the mile. These are always measured in cents. The table below shows how Westjet calculates their CASM. The industry as a whole is pretty consistent in the approach. However, three things to be wary of are: 1) depreciation and amortization calculations, where this is of course a non-cash estimate. Westjet is more conservative (read, less generous to itself) than certain other peers.. which we are happy about. 2) Maintenance charges, where airlines accrue major maintenance expenses based on the time to the next major maintenance event (say 5 years for an newish engine) and actual cash costs can differ – financial shenanigans (read, underreporting expenses) with this item would be a short-term gain long-term pain situation. We are not concerned here. 3) Management excluding “certain one-time items” from expenses. Westjet in general seems to have a lot fewer of these sorts of things than certain other peers. The table below shows how Westjet has performed going back to 2002. 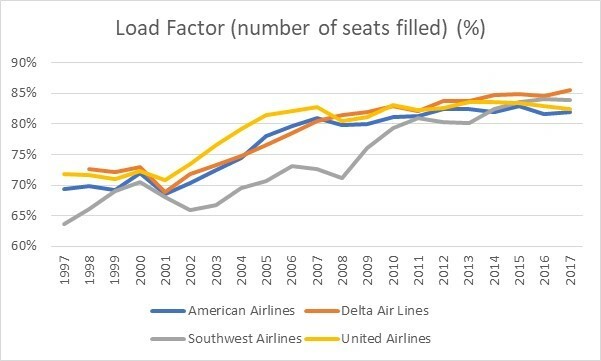 Over the last decade the Company has grown seat miles by 8% a year, while maintaining an above 80% load factor and a 10% margin per ASM. Not bad. 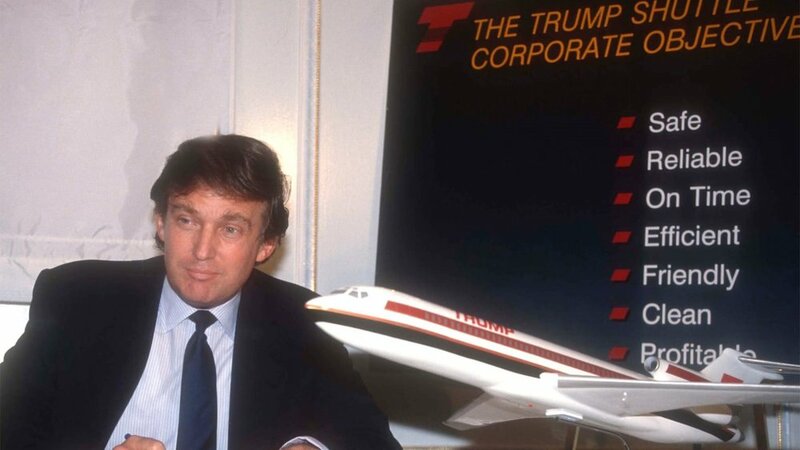 But it is important to not just buy a plane but to use it. A great way to keep margins strong is to just fly your planes less! Westjet is getting about 185-220 million ASMs out of each plane (you can also look at hours utilized). Their utilization is down over the last few years but it is also at a time when they are growing their fleet materially and optimizing it. 2) How is that return on investment? -At the core – beware of estimates. Grossing up leases by 7.5x and assuming an implied interest rate of 7% seems reasonable (note that Air Canada grosses up by a smaller amount – 7.0x). They also both are affected by depreciation and maintenance cost assumptions and… one-time items. -They both calculate before tax. One of us has strong feelings about this. If you could invest in a business that was making an annualized 30% return on a tropical island with 0% tax or a company making 30% in a business unfriendly place charging you 90% tax, which would you choose? Or, in other words, to ignore tax implications seems crazy but we are the only person on the plane screaming about this. Calculating returns - We prefer it our way. The table below shows their after tax return on invested capital and after tax return on equity. 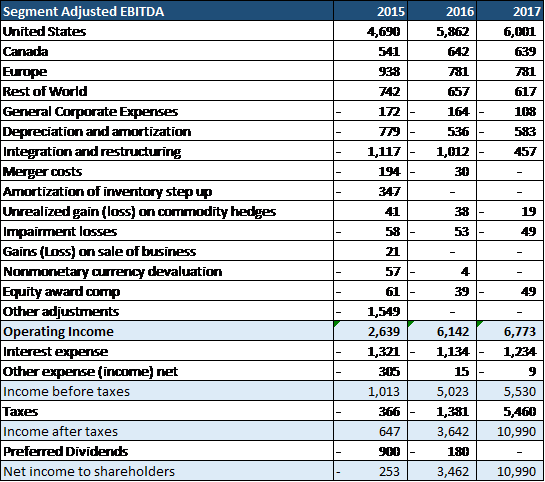 A 21% average return on equity for a decade is quite impressive, particularly when Westjet has also made ~$710M of share repurchases since 2010, including $90.3M in 2017. Are fuel prices something to worry about? If you take a look at our article on the U.S. airline industry (see it here), one very important key aspect of the thesis is that as an industry the airlines are practicing price discipline. The thesis is that as an industry they are diligent about not creating too much capacity and maintaining airline ticket discipline as well. As all Albertans will remember, oil dropped quite dramatically over 2014-2016, bottoming out at @$27/barrel in January of 2016. We took a look at how Westjet’s RASM and CASM correlated with jet fuel prices. Fuel has represented about 20-30% of operating costs in recent years. As expected, Westjet benefited from lower jet fuel prices but only temporarily as airline prices industry-wide as a whole drop. Going forward, we expect the same to hold true for rises in jet fuel costs, albeit likely more slowly - No one wants to be the first to increase their fare price. That said, we view there being no permanent decrease in airline margins because of this. One wild card is if oil and jet fuel increase so significantly that they materially reduce the affordability of flying leading to an industry-wide reduction in flights taken. Fuel is only 20-30% of costs and airlines were just fine when oil was $100. Or in other words, if oil hits $200 a barrel there are probably a lot bigger problems in the world than the cost of your next flight to Hawaii. 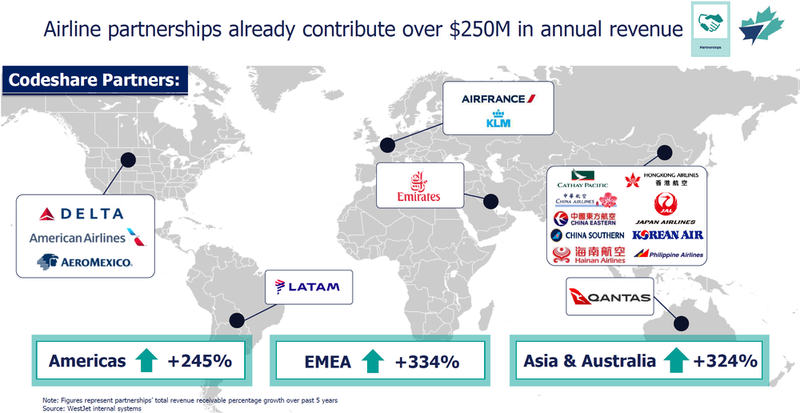 As we discuss in our recent airlines article (see here), Warren Buffett made a significant investment in the big four U.S. airlines (approximately 10% of each). While we are still waiting for him to call us back, we believe that the thesis is that the large North American airlines have significantly changed how they operate, are being more diligent with their capital, and also have numerous scale and regulatory advantages that has created a moat. Going back to the roots of Westjet, it was born in 1996 as a simple low-cost carrier with a strategy copy-and-pasted straight from Southwest Airline’s latest investor presentation at the time. Simple plane fleet (Boeing 737s), non-unionized pilots and flight attendants, and good incentive pay for these staff instead of unionization. It worked extremely well for awhile. A long while. But the world has changed. Co-Founder, former CEO, and Chairman Clive Beddoe continues to have significant influence on the Company. Clive has been instrumental in the original strategy and helping the company adjust course. For example, he pushed forward the Encore subsidiary strategy. These movements 1) mirror what U.S. airlines are doing (regional subsidiary feeders for example) and 2) are in line with what we think they should be doing. As a side note, Clive was likely a very key part of the CEO change, and we are just fine with that. He has a good track record of pointing Westjet in the right direction. 1) Scale – bringing cost of capital advantages, purchasing advantages, and ability to handle increasingly large regulatory burdens. It should be noted that Westjet maintains an investment grade credit rating and is de-levering. We view Swoop and the 787 dreamliner (i.e. international flights) as extensions of the above items and a rational response to the changing environment. Both Westjet and Air Canada now operate low cost carriers and international flights, which must be quite discouraging for any competitors out there (Canada is a small market after all). Frankly, our view is that the competitive nature of the Canadian airline industry makes it very unlikely that any of the upstarts are able to become the next Westjet and instead will likely only have success on certain specific routes. The entire North American airline industry has gone through a long history of capital destruction and the transition to large scale financially strong stable airlines is a rational if not the healthiest outcome. Note on unionization - It should be noted that we believe that Westjet becoming unionized was inevitable and we are not concerned about it. As an industry it is becoming more regulated, including rules around pilot and flight attendant scheduling, and as an industry it is significantly unionized already with no one really having a material labor advantage over others. We expect that Westjet’s overall employee cost per job role will be very similar to Air Canada and view this as a permanent erosion of this cost advantage. Valuation – What would you pay for that ticket? The core of our thesis is that Westjet will continue to do well but not as well as before. We believe that there are is permanent reduction to their cost advantage vs Air Canada. But that’s OK and assumed. Secondly, the Swoop and international expansion are rational changes in strategy and ultimately it is not a great environment for upstart competitors. Canada is a small market after all. 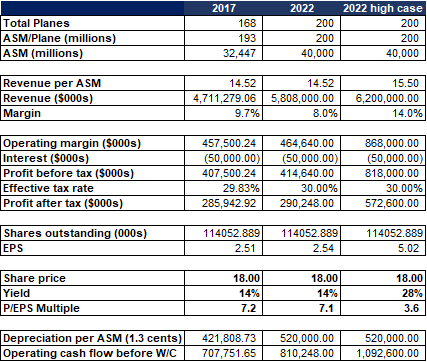 Westjet is targeting to grow its fleet from 167 to up to 265 by 2023-2027 and expects to be able to grow its fleet over the next few years while still having free cash flow (we agree with this). Looking a few years out, you would be sitting on a 3-6x P/E investment based on the current share price and the assumptions below. We expect that the next 20 years will be harder than the last 20 for Westjet but you don’t have to keep getting rich at the same rate you have in the past.